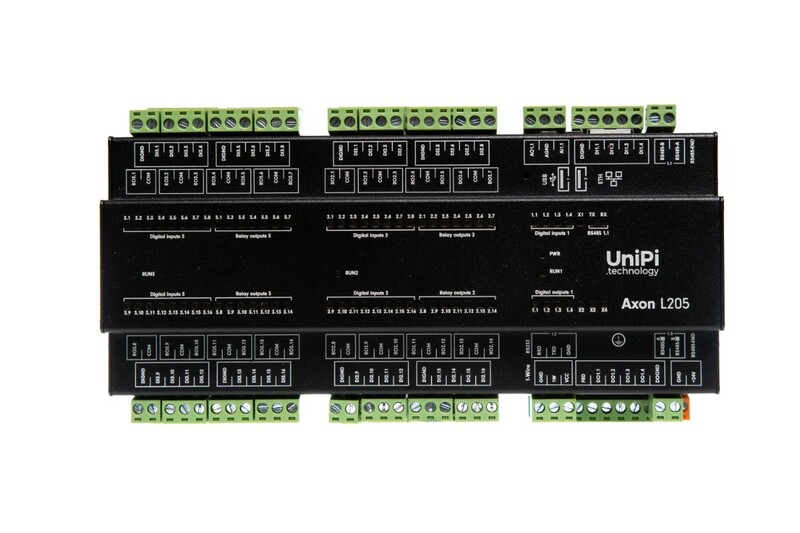 UniPi Axon L205 is a programmable logic controller (PLC) designed for control, monitoring and regulation. 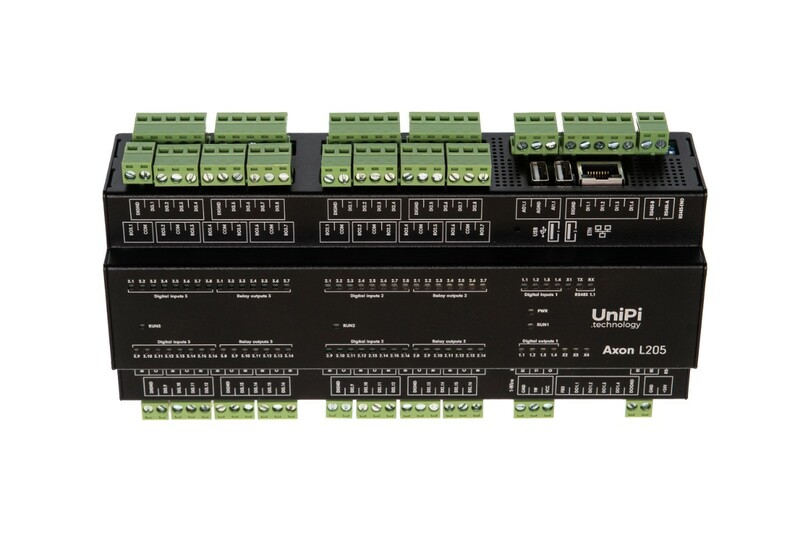 L205's architecture focused on digital inputs and relay outputs, but offers significant increase in I/O number. The L205 is a basic model of the Axon L. It represents an enlarged variant of the M205 model with significiantly increased number of digital inputs and relay outputs. 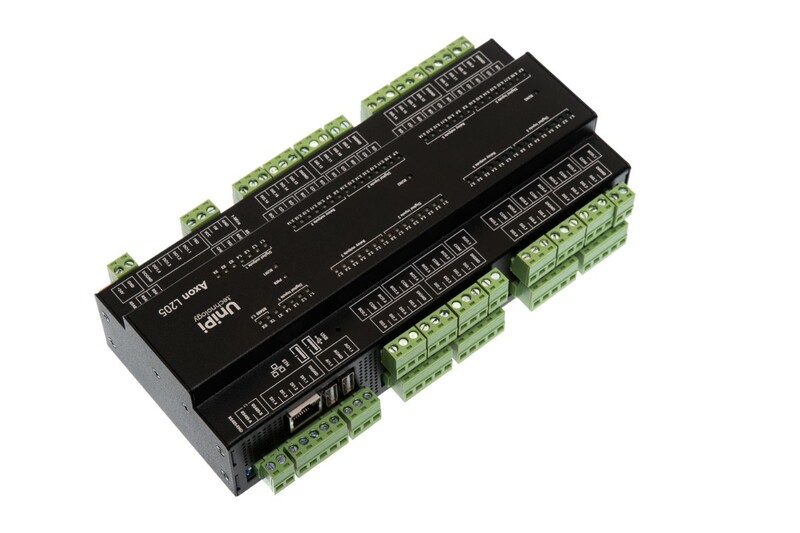 Digital inputs can be used for reading digital signals from corresponding sensors, relay outputs are then suitable for switching various two-state devices such as boilers, water heaters, circulation pumps or other, stronger relays. That makes the L205 especially suitable for control of intelligent heating, ventilation or air conditioning (HVAC) systems. 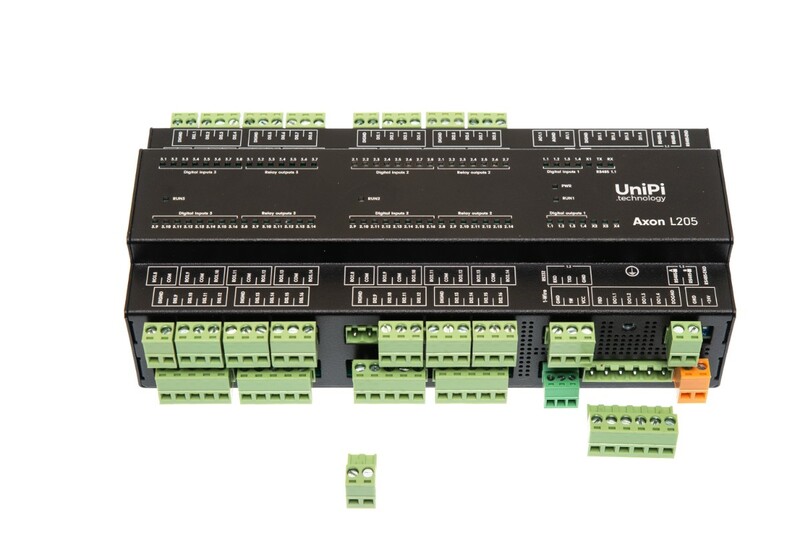 The controller also features a single RS232 serial line for communication between two devices. 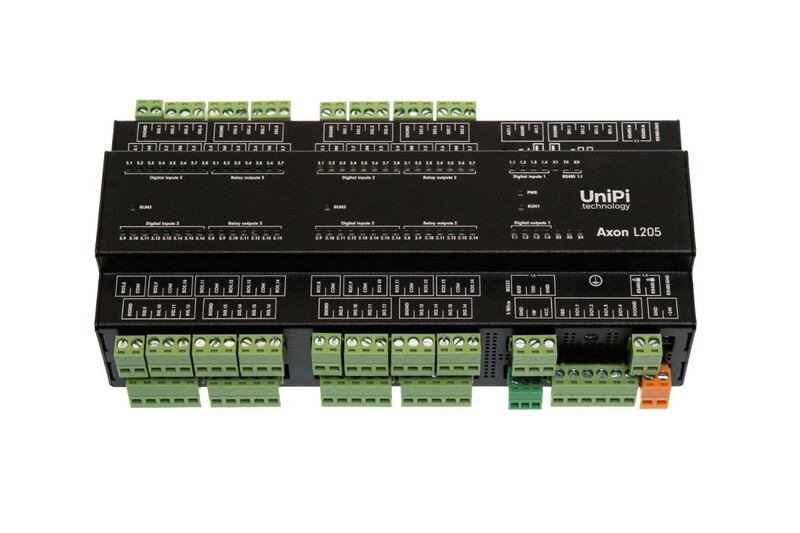 In automation, it is most often used for communication with HMI displays, various gateways or closed technologies. Included is a single 1-Wire bus, using 2 or 3 conductors for communication with simple sensors such as thermometers, humidity meters or light intensity meters. A single bus can communicate with up to 15 sensors with maximum total length of the bus up to 100 meters. 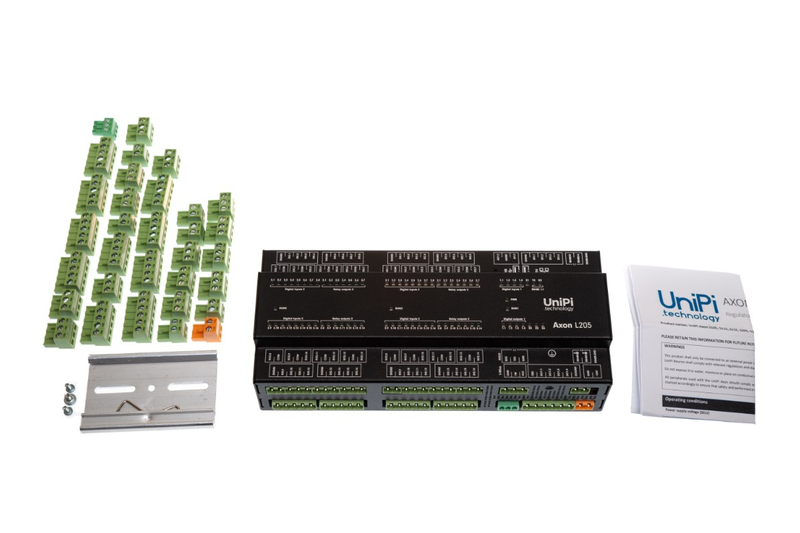 Customers can choose from a widee variety of software solutions thanks to the open nature of Axon controllers, and are not limited to a single platform. Available are both professional and open-source solutions. 8GB eMMC onboard memory provides a high degree of reliability during repeated rewrites compared to systems using memory cards. All components are protected by a durable anodized aluminium case providing IP20 protection. 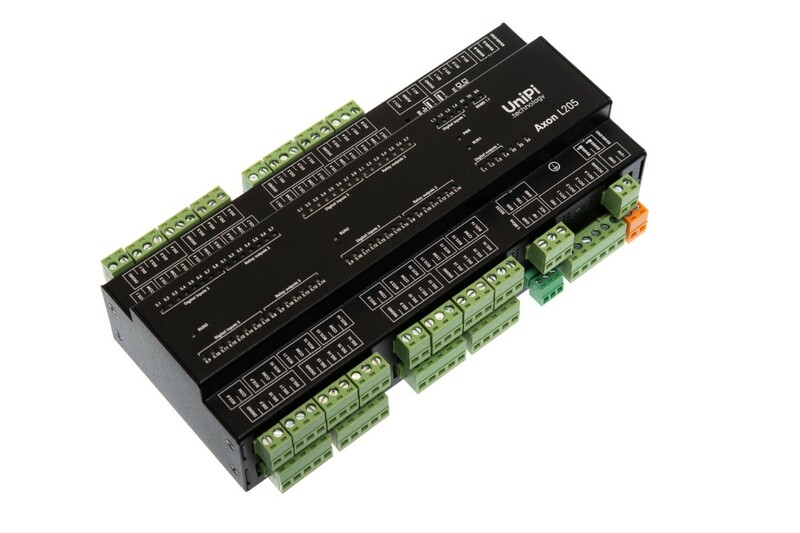 The unit’s size is 12 DIN modules, DIN rail holder is included in the package.